Moscow, Idaho – University of Idaho performed especially well in a recent ranking of Forestry degree programs. 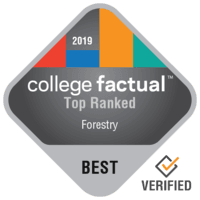 College Factual ranks programs offered by four-year colleges and universities and has recently updated its rankings. Idaho’s Forestry program has been ranked #1 in Idaho. This makes the Forestry program at the school the best in the state. Idaho has achieved this ranking 2 years in a row. See the full ranking of Forestry programs in Idaho. Based upon PayScale survey data*, a student who graduates from Idaho with a degree in Forestry will make average early-career earnings of $36,951 and average mid-career earnings of $65,057. Learn more about outcomes at University of Idaho. University of Idaho is located in Moscow, Idaho in what is generally considered a rural atmosphere serving approximately 9,600 undergraduate students. Get notified when similar news about University of Idaho happens.